Calicut Live opened about 3 months ago in Salmiya and since then, all I've heard have been recommendations after recommendations about how I need to try it out. Calicut, or Kozhikode, is in Kerala (my home state) after all and so I rallied up the gang and went out for dinner over the weekend. I let my friends who had been before do all the ordering and just braced myself for all the dishes that came flying out of the kitchen. We were a small group and so ended up ordering multiples of a lot of the dishes, feed the masses they say! I'd heard that the restaurant had been serving Chukku Kaapi (Kerala style dry ginger coffee) as their welcome drink, but to my disappointment, we were just served regular fruit juice. I'm hoping they bring the ginger coffee back. First up, the kids had the Sweet Corn Chicken Soup (KD 1.250) hence the lack of a photo. I did have a small spoonful and it was good, but it could've been creamier. The kids loved it though. I'd heard from several friends that the appetizers in Calicut were exceptional and on asking the waiter, he recommended either the Kanthari Fish (KD 3.000) or the Chicken. We tried the fish and it was exactly as I'd thought it would be, delicious! Large chunks of fish filet, carefully marinated and delicately cooked. Kanthari, or rather bird's eye chili is a small red chili that is rather potent! But despite being a dish named after a chili, it wasn't overly spicy. The heat was well balanced and the dish was just enjoyable. I'd love to try the Chicken next time as I've been told that it is just as good, maybe even a tad better! Next up were the Tawa Grilled Prawns (KD 3.000). On paper this was supposed to be a good dish. Prawns in shell with an aromatic masala paste? Yum! I loved the flavours, but the masala was just too raw and left a powdery grit like feeling on the tongue. I think the masala just needed a few more minutes in a hot pan to cook it through. Had a chance to speak to the manager about the dish afterwards so I'm hoping they'll work on it. It truly had the makings of a great dish. 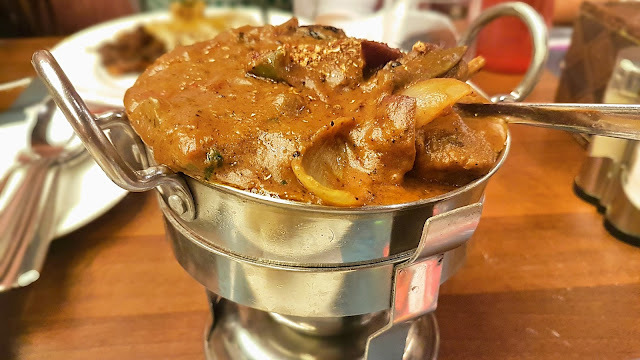 Oh the Beef Ularthiyathu (KD 2.000) is a must order. Slow roasted with spices, coconut slices, curry leaves, it screams Kerala and will go excellently with porotta or even appam. 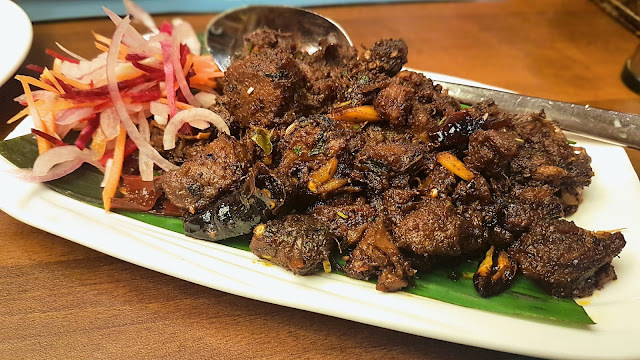 If you're a fan of the traditional Kerala style beef, this is for you. Calicut Live makes great wheat porotta too if you're interested! Next up, we ordered the Mutton Bamboo Biriyani (KD 2.500). We ordered this mainly for the drama of it all, steamed biriyani in a bamboo log? Why not! Our waiter knocked twice on the bamboo log (Log, trunk? I'm not quite sure what to call it) and then pushed the steaming contents out onto our plates. 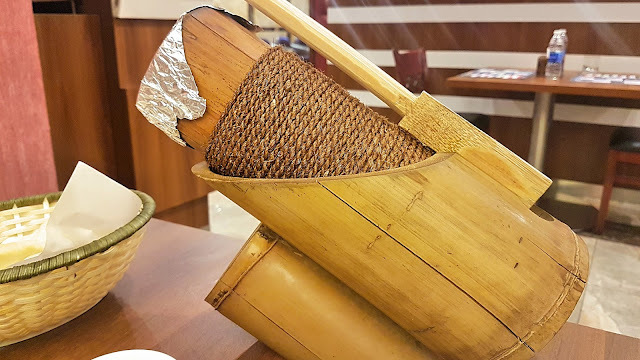 The process of steaming the rice in the bamboo locks in moisture and flavour. Loved the biriyani and the novel way in which it was cooked and served. A definite must order. 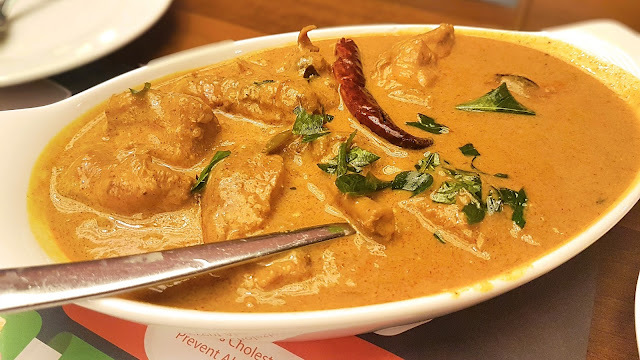 We also ordered the Mutton Kadai (KD 2.500) pictured above and the Achayan Chicken Curry (KD 1.800) shown below. Both were forgettable dishes that I probably wouldn't recommend to anyone. I would love to try other dishes on the menu over these two. 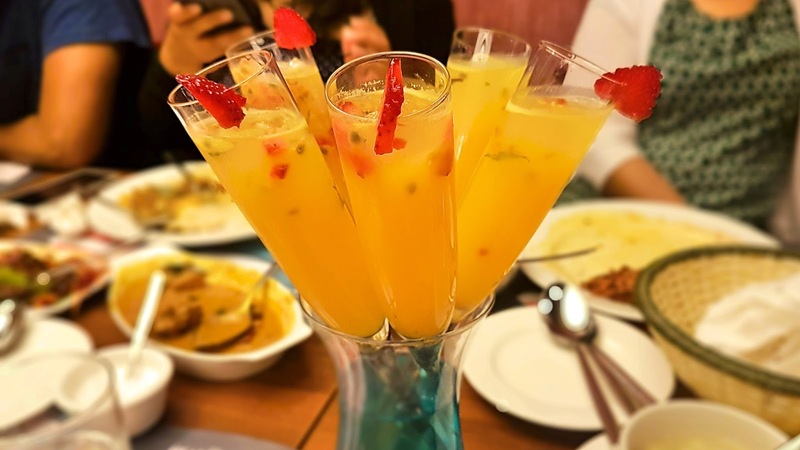 For drinks, we had the Passion Fruit Monchathi (KD 1.250). Ask for the drinks to be split into two and they'll be served in a vase like below. Delicious, nothing to complain about. We contemplated ordering another round! 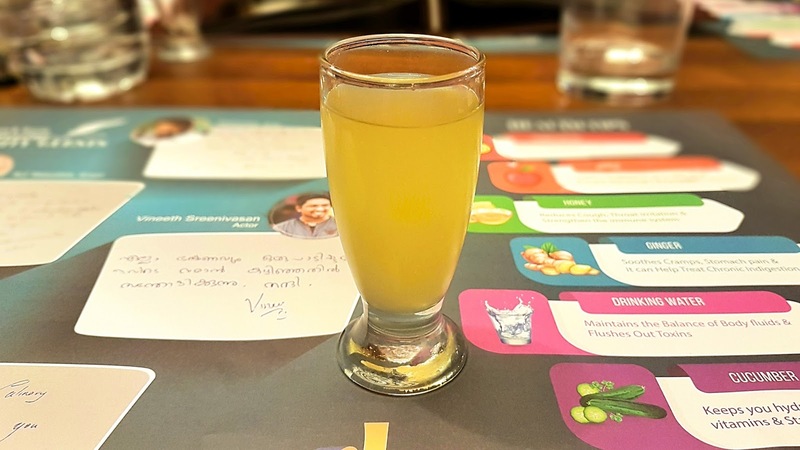 Other drinks to try are the Koolikatha Sharbath and if you can handle the heat, the Green Fire, which is a sweet and spicy chili infused drink. 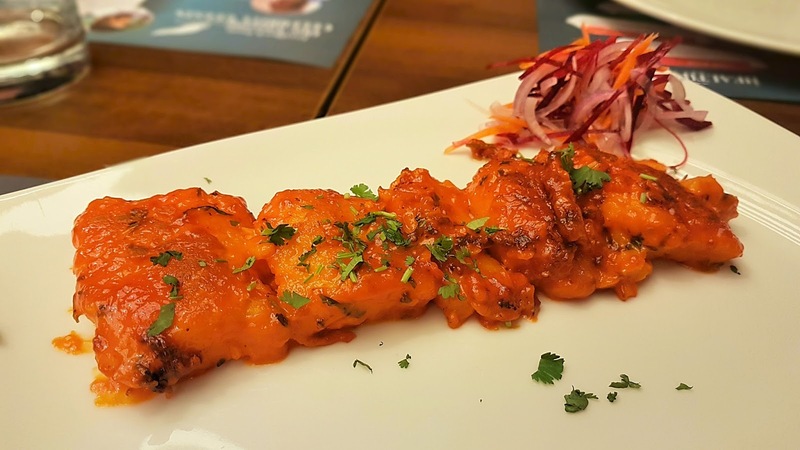 The Golden Fried Prawns also sounded delicious and they're on my list for next time along with the Kanthari Chicken of course! Calicut Live is located in the Anfal complex, the same building that houses Nasser Sports and Twenty4 in Salmiya. Also, check out their menu below. (It isn't their full menu though. I pieced it together from images sent to me via Whatsapp and it looks like I'm missing a few pages). Our meal for 7 adults and 2 kids came up to just under 35 KD. That's ridiculously cheap for the amount of food we ordered - a soup, a biriyani, 9 sides, porottas and drinks! 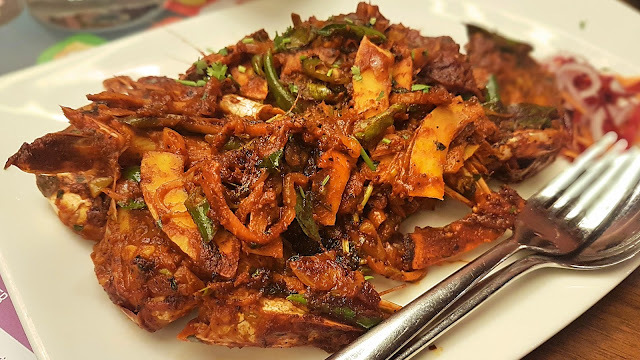 Calicut Live, give them a try the next time you're in the mood for some authentic Kerala cuisine.